Actor Otis Winston speaks with students during the Monday Motivation session at Lima West Middle School. LIMA — As a child, Otis Winston never could have imaged not only overcoming his speech impediment, but also becoming a basketball star and building an acting career. These were accomplishments he said he made possible by believing in himself and facing his fears. Growing up the Youngstown native struggled with stuttering and was constantly made fun of my his siblings and peers. This had a negative impact on his life. Instead of facing his issues, he continued to get in trouble at school. It was not until he turned 10 that he and his family moved to Toledo shortly after his father was sent away to prison. Even after moving to a different school, he continued to get in trouble. However, it was his principal Mr. Wilson that he said changed his whole perspective on life. It was after that moment that he realized why he stuttered. He realized that stuttering happened because he was always in a rush. Finally after slowing down, one day while talking to his mom, he noticed he had not stuttered. He said that was an emotional moment for him and from that day on he began building his self-confidence. His self-confidence led him to pursue sports in school, which he said at first did not come so easily to him. His sixth grade year, he tried out for the basketball team and did not make it. He said he had people doubt his abilities the whole time. However, after practicing for a year, he tried out again and not only made the team but was one of the best players. His basketball career led to him becoming the team captain of the Ohio State basketball team. West 7th-grade student Idarius Strickland said Winston’s speech inspired him to now face his fears. “Today I learned to not be afraid to make that shot when you are playing basketball and to not be afraid to fail,” said Strickland. 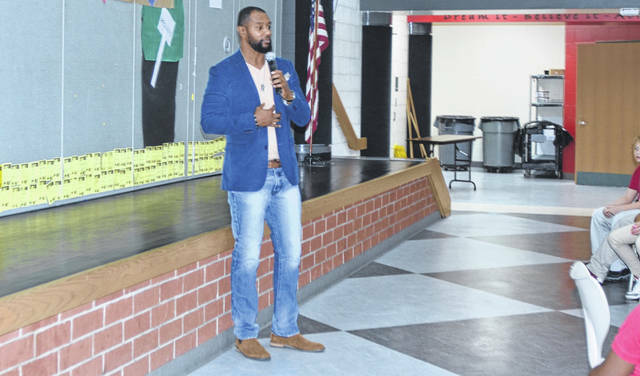 https://www.limaohio.com/wp-content/uploads/sites/54/2018/11/web1_Otis.jpgActor Otis Winston speaks with students during the Monday Motivation session at Lima West Middle School. Reach Camri Nelson at 567-242-0456 on Twitter @CamriNews.